Unabridged Note: Dasyochloa has been included in Triodia, Tridens, and Erioneuron. It resembles Munroa, in its bracteate inflorescence (Caro 1981). Seedlings of Dasyochloa, as in those of Erioneuron, are shaggy-white-villous. These "hairs" are composed of hair-like, water-soluble crystals, a product of transpiration, which wash off in water. Habit: Perennial herb, stoloniferous or mat-forming. Stem: generally 4--10 cm, scabrous or puberulent, initially erect, becoming bent, rooting at base of inflorescence. Leaf: not basal; sheath with a tuft of hairs at throat, < 2 mm; ligule of hairs 3--5 mm; blade 2--6 cm, folded. Inflorescence: panicle 1--2.5 cm, 1--1.5 cm wide, terminal, short, dense, branches spike-like, bearing 2--4 subsessile to short-pedicelled spikelets, subtended by leafy bracts, densely white-pubescent, light-green or purple-tinged. 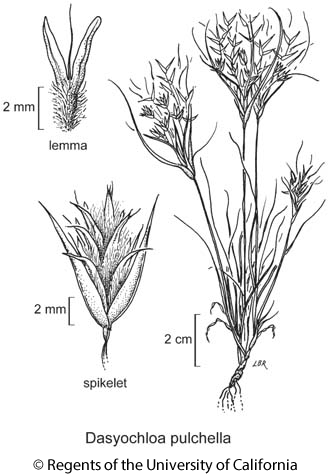 Spikelet: generally 6--9 mm, laterally compressed, florets (4)6--10; axis breaking above glumes; glumes 6--9 mm, subequal to adjacent lemma, glabrous, 1-veined, short-awned to mucronate; florets bisexual; lemma 3--5.5 mm, densely long-hairy below and on margins, thinly membranous, 3-veined, 2-lobed to +- 1/2, obtuse, midvein extending into a straight awn; palea 2--3.5 mm; anthers 3. Chromosomes: 2n=16. Synonyms: Erioneuron pulchellum (Kunth) Tateoka; Tridens pulchellus (Kunth) Hitchc. Citation for this treatment: Jesús Valdés-Reyna 2012, Dasyochloa pulchella, in Jepson Flora Project (eds.) Jepson eFlora, http://ucjeps.berkeley.edu/eflora/eflora_display.php?tid=22360, accessed on April 25, 2019.